After a tough walk, we arrived to Logroño and diverged from the Camino to meet the owner of our Airbnb. We booked an apartment to ourselves for two nights to explore the city, do laundry and relax for a day- and that's exactly what we did! After showering and doing laundry we went to explore the Old Town. We immediately went to the street famous for its tapas. However, after 3pm the tapas are stale from sitting out so we were largely disappointed in these world renowned snacks. We shared a small coffee gelato as we wandered around the city and it totally hit the spot. The next day (our rest day) we utilized Logroño's free bike service to explore the city. It took me about 10 minutes before I was bored. I thought I'd appreciate biking more since you move so much faster than walking but nope, not for me. Maybe I was just too committed to the rest day and was feeling lazy. We rewarded ourselves for the 30 minute bike ride with tapas (and beer, of course) at 2pm and wow the difference was amazing in the freshness of the tapas. For dinner, we made salad and oh my, it was everything. We eat pretty well on the Camino, but we definitely don't eat enough vegetables. Finally, we almost cried tears of joy when we found a channel on Spanish television playing a movie in English. It was a Steven Segal movie and was extremely dramatic but we were thrilled nonetheless. Walking into any city is tough because you have to get through the less pleasant suburbs first. 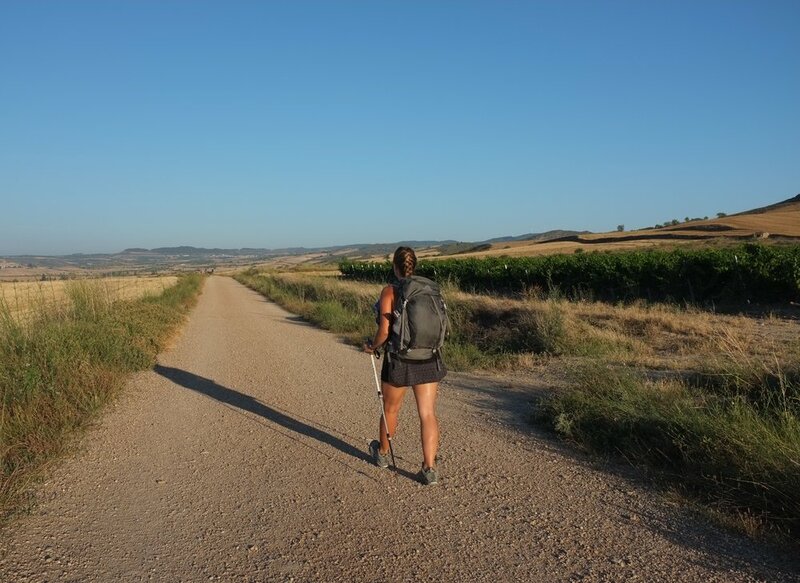 Walking into Logroño was especially treacherous the last few miles because of the endless pavement and lack of shade. My mom is SO strong, but this last leg of the journey was toughest yet for her. With one seemingly endless mile left until we crossed the bridge into Logroño, we met up with our friends John and Joe. Both are very funny and chatty and kept us going. I was reminded by a fellow hiker to stop and smell the roses. Literally, we stopped and took in the wonderful rose smells along the road. Also, grateful to wash our clothes and have a breather in this historic city. Hoping to satisfy a salt craving, I bought a bag of Cheetos in a small market. Disappointment set in when I realized they tasted like cornflakes with ketchup, yuck. Don't expect everything to taste like home.